Our drop in temperatures throughout Ohio will no doubt convince fall home invading insects that it's time to seek winter quarters. 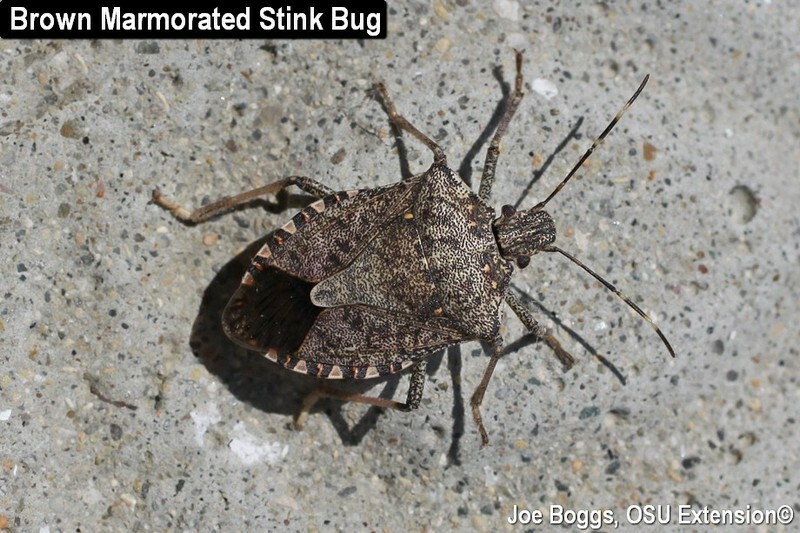 These unwelcomed guests typically include Boxelder Bugs (Boisea trivittatus); Western Conifer Seed Bugs (Leptoglossus occidentalis); Magnolia Seed Bugs (Leptoglossus fulvicornis); Multicolored Asian Lady Beetles (Harmonia axyridis); and the most notorious of all, Brown Marmorated Stink Bugs (Halyomorpha halys). These home invaders have several things in common. First, their populations may vary considerably even across relatively short distances. Some homes may be inundated while those located just a few miles away remain free of insect marauders. Even more challenging, late-season outdoor populations are not always a reliable predictor of indoor excursions. Just because you didn't see them in September doesn't mean you won't see them sitting next to you on your sofa in November. The second thing these home invaders have in common is their "cold-blooded" physiology meaning the speed of their metabolism is mostly governed by ambient temperature; the higher the temperature, the faster their metabolism, and the faster they "burn" fat. Yes, insects have fat, but it's confined by their hard exoskeletons so they don't suffer ever-expanding waistlines. The insects are attracted to the solar heat radiating from southern or western facing roofs and outside walls as well as the warmth radiating from within. This can lead them into attics, outside wall voids, and spaces around door jams and window frames that make perfect overwintering sites. They stand a good chance of surviving the winter as long as they remain in these cool, protected sites. However, sometimes they make a terrible error; for both the insect and a homeowner. Instead of staying put, they continue to follow the heat gradient into homes. This is accidental and disastrous for the insects because the high indoor temperatures cause them to burn through their fat reserves and starve to death. And, they do not go gentle into that good night! Starving brown marmorated stink bugs and multicolored Asian lady beetles commonly take flight to buzz-bomb astonished homeowners and terrified pets. The best defense against home invaders buzzing or lumbering around inside a home is to prevent them from entering in the first place. Although there are effective indoor marmorated stink bug traps, they shouldn't be used in place of sealing openings that allow the bugs to enter the home. An ounce of prevention is worth a pound of bugs. Large openings created by the loss of old caulking around window frames or door jams provide easy access into homes. Such openings should be sealed using a good quality flexible caulk or insulating foam sealant for large openings. Vacuum cleaners present their own set of risks. A "direct-fan" type of vacuum cleaner should never be used. Passing the refuse through an impeller will create a horrifying bug-blender! Even a "fan-bypass" type (e.g. Shop-Vac) with the refuse bypassing the impeller can develop a distinctive scent if used on stink bugs because the bugs will release their defense odor in response to swirling around inside the vacuum tank.